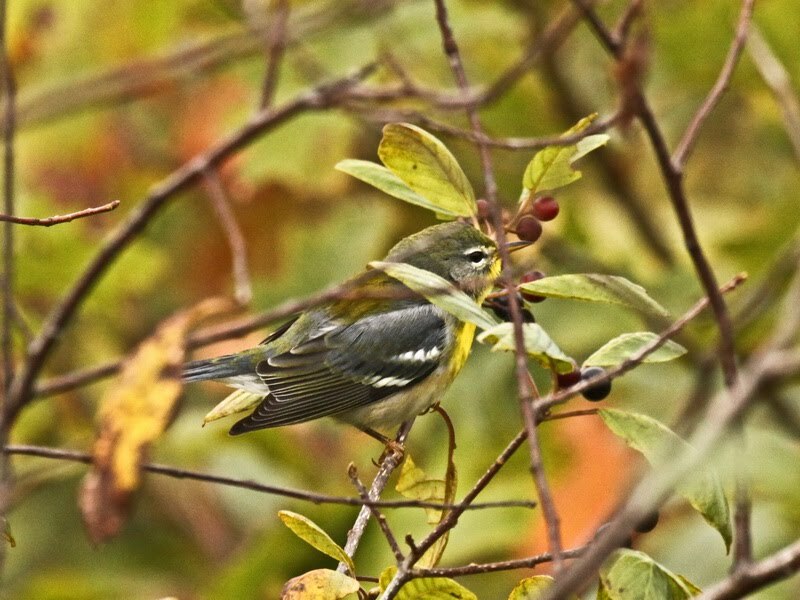 This third American Wood Warbler (Family Parulidae) Photo Gallery is possible because I was able to spend several long mornings this past week looking for and, in some cases, photographing these jewels. ... and then there was everything else. More soon. 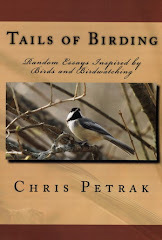 For many years, I have been concluding my column in the Brattleboro Reformer with the words, “Good birding.” Lately, I have been thinking about what the words mean, and how many different levels there are to good birding. I have also come to realize that good birding has meaning for me that it did not have some years ago. Among some of the most avid birders, good birding means a long list - a day list, year list, or life list of birds identified. If you can identify it by sight or sound, you can list it, and hurry on to find something new. This means that if a bird bursts from the forest floor and disappears, you can tick off Ruffed Grouse. 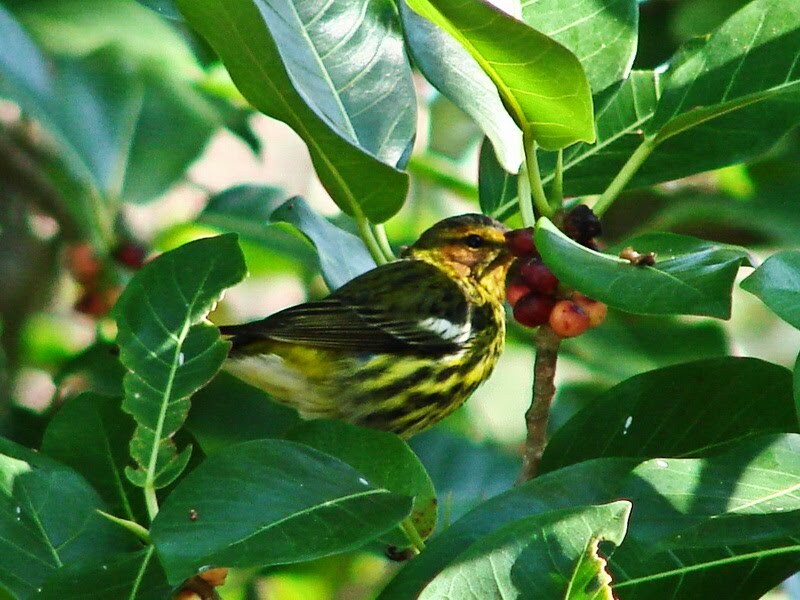 If you hear “zee zee zoo zee” from the top of a tree, you can tick off Black-throated Green Warbler. You may just glimpse a bright red movement in the leaves but it is enough to tick Scarlet Tanager. You may never know where the songster is perched, but you know Wood Thrush and Hermit Thrush when you hear them and can add them to the list. At the end of the day, satisfaction comes from the long list of birds that have been ticked. The World Series of Birding took place two weeks ago. Highly skilled teams of birders competed to see who could list the most species within the State of New Jersey in one day, from midnight to midnight. The winning team had 228 species, many (perhaps most) identified by song, alarm call, or flight call. The event provides an annual snap-shot of the birds present in New Jersey in mid-May, and raises hundreds of thousands of dollars for conservation organizations. And, a single day list in excess of two hundred will qualify, among most people, as a day of good birding. Occasionally I spend a day birding with a friend who has an excellent ear for bird songs and bird calls. He quickly recognizes the song of an uncommon warbler. But he is never quite content just to know what is there. He wants to see it, and not just a glimpse - see it so that the color and markings are clear - so that he can compare it to the illustration in the pages of the tattered field guide he sometimes carries - and enjoy the visual feast. Long minutes are spent staring into tree tops or peering into a tangled thicket searching for the bird, waiting for it to appear among the leaves and then stay still for a few brief moments. 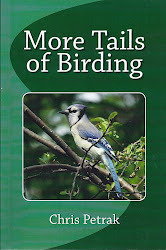 This is good birding that is very different from making long lists. This is birding that is satisfied only when the bird is seen, and seen well. In the last few years, making lists has become less important, and watching birds has become more important. Early this week I wandered the roads on Stratton Hill in Marlboro and Newfane. I heard all of the usual birds and saw most of them. But the best experience was in an open grove of pine trees. I saw a small brown bird fly from one tree to another, then to a dead pine where it creeped its way up the trunk and disappeared beneath loose bark about sixty feet above the forest floor. Then it creeped out the top of the bark, creeped upward on the trunk, and finally flew off. The scene repeated as a pair of Brown Creepers returned again and again to the loose bark on the trunk. At first, I thought they were carrying nest material, but with more careful observation, I saw that they were carrying food. Beneath the loose bark was a nest with young that were being fed. The Brown Creeper is the forest waif; it lives in our woods year round, begins singing in early Spring, and is well into the task of raising of young when most birds are just getting started. The twenty minutes I spent watching the creepers defined good birding for that morning in the woods. Over the last few years, I have added photography to my birding. The camera has contributed significantly to my rethinking of what good birding means. For example, when I make my annual Spring trip to Cape May, there are two southern warblers which are targets. This year I saw both of them. I heard the Yellow-throated Warbler singing from the top of pine trees. I had a very clear look at the bright yellow throat and bold black and white pattern of the wings and back. The look was brief - seconds at best - but much better than in some previous years. There was no opportunity for a photographic attempt. In a beaver swamp in the late afternoon, I heard the sweet notes of the Prothonotary Warbler. Kaufman calls this warbler the “golden sprite of swampy woods.” I did some pishing, and in moments the bird was investigating me, examining my intrusion from an open branch not twenty feet from where I stood. When I put the camera on him, his golden head and breast filled the viewfinder. The camera clicked away. A day of good birding had gotten better by several degrees. Shorebirding often means peering through a scope, looking for slight differences in the similar looking birds which will give away the presence of something unusual. I still do this type of shorebirding. But with photography as an interest, I now find myself sitting on the sand, waiting for the Sanderling or Piping Plover to run into the ebbing water so that I can capture it in mid-stride. Or, I find myself waiting for the next clownish act in the oystercatcher’s courtship. This stocky shorebird stays on the beaches and tidal flats. It looks like a clown, and when breeding season is getting underway, the antics it uses to impress a mate turn looks-like-a-clown into reality. That’s good birding. Early this week I roamed the roads and trails in the old Green Mountain town of Somerset with a friend. Broad-winged Hawks called in at least three different locations, protesting our brief passage through their nesting neighborhood. From snags and tangles in large meadow-like clearings, Lincoln Sparrows sang their songs. It was the first time in several years that I had encountered this rare Vermont breeding bird. Hawks and sparrows ... and good birding. But there is no need to wander distant seashores or trek through tangled mountain forests for good birding. One day recently, I watched a robin with more nesting material in her beak than she could easily carry. She waited on a branch for me to move along, so that when she flew to her nest, she would not give away its location. Good birding. The House Wren sings from dawn to dusk in my yard, as he simultaneously goes about the business of nest building and mate attracting ... except, when I walk through the yard in hopes of watching him as he toils away. When I enter his domain, he falls silent, wary about my intrusion. When I walk back to the porch where I belong, he sings. Good birding. When a Hairy Woodpecker works the suet persistently, finally ripping out a huge chunk and flying off, then the birding is good. When a titmouse suddenly spreads his wings and bows low to the ground in courtship display, the birding is good. When mother merganser leads her brood down the river behind my home, the birding is good. When the cardinal visits the bird feeder for the last time on a spring night, chipping quietly to his mate, the birding is good. When the robin rattles in the fading light, and the Veery sings his vesper song, then the day has ended with good birding. In fact, more than just a few moments of good birding. I've been able to get out several morning each week to wander the roads and look for birds. This is a taste of a few birds who defined something more than just good birding. Continuing with the American Wood Warblers (Parulidae), here are a few more. Some of these photos have appeared in early posts. Last Saturday, our local Audubon chapter sponsored a “Warbler Walk.” A dozen people wandered the trails around Brattleboro in search of the tiny little birds known as wood warblers. By the end of the morning they had seen or heard fourteen. On several occasions, as they craned necks toward the tree tops, you could hear little gasps as binoculars found one of the elusive birds flitting among the leaves. Even more of a gasp came when the sun broke the clouds and illuminated the bird as it paused on a branch to sing. The American wood warblers are a western hemisphere family, Parulidae. The family includes 25 genera and about 115 species, although taxonomy is an ever changing science, so don’t hold me to those numbers. 15 genera and 51 species can be found in North America, and the good news is that 70% of those can be seen in the eastern United States as breeding birds or regular migrants. Within Windham County, at least twenty species nest, and another half dozen migrate through. The wood warblers are often spoken of as the jewels of North American birds; birders come from around the world to search them out. And for good reason - not only can they be a challenge to find among the foliage, but when found they often provide a visual feast. Many of the males are gorgeous, and the females aren’t bad either. With a common name like “warbler,” one might think that the wood warblers are great songsters. Not necessarily. If you want a good warbling song from a bird, you should listen to the goldfinch, the Indigo Bunting, Warbling Vireo, or Rose-breasted Grosbeak, to name a just a few of the highly competent warbling birds who are not wood warblers. Some wood warblers are competent singers, like the Yellow, Chestnut-sided, or Magnolia, to name three. Many others have what I can only describe as a poor excuse for a song: thin, wiry, buzzy, whiny, or wheezy. But, for example, when the Blackburnian Warbler betrays his presence with his enemic, lisped notes, then pauses on a sunlit branch to repeat those notes, his throat blazes with fiery orange, and you can only be awed. 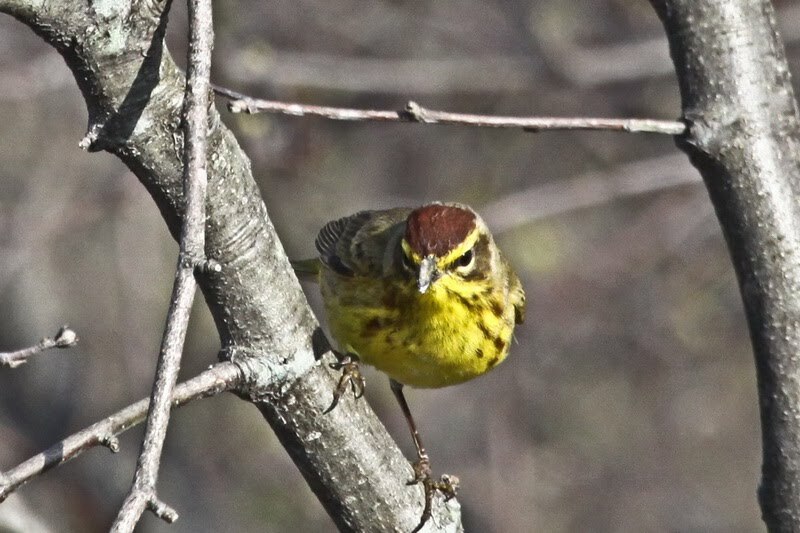 The term, “warbler,” was first applied to the Eurasian family, Sylvia, in the late eighteenth century; in general, these Old World warblers have attractive songs, or at least marked vocal powers” (Mullarney, et al.) The name, “warbler,” then became attached to the unrelated but similar appearing American family, Parulidae. The two families are generally similar in size and shape, though when it comes to splashy plumage, the American wood warblers win hands down. Physically, the significant difference between the two families is the number of primary feathers: the American wood warblers have nine primary feathers; the Old World warblers have ten primary feathers. Like most families, the American wood warbler family is diverse. Its largest member is the Yellow-breasted Chat which neither looks nor sounds like a warbler. 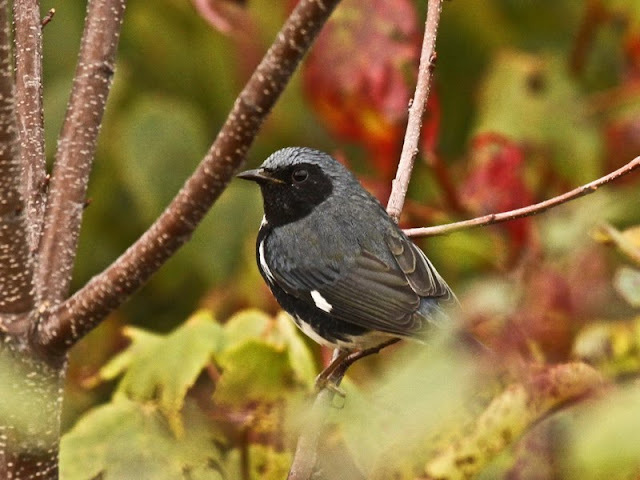 Found to the south of New England, this white-spectacled, chunky warbler scarcely acts like a warbler; vocally it sounds like a thrasher or catbird with hoots, gurgles, clucks, and whistles. Three Parulidae are found in the dark beneath the canopy and like the chat do not look much like warblers. The Northern and Louisiana Waterthrushes are found, respectively, in still-water woodland swamps, and along fast moving streams. Both look like small Spotted Sandpipers, even to the persistent tail bobbing. But each has a musical ability that might be called a warble, and that a Spotty can only dream about. The ground nesting Ovenbird belts out “teach-er teach-er teach-er,” a song that resounds through the forest understory. Each Spring I listen carefully for the first song of the Ovenbird; it is reassurance that the cycle of life has successfully turned for another season and another year. In general, the wood warblers are small songbirds (4-5 inches in length) with short, slender, pointed bills. Most are arboreal, living within a wooded environment in the mid to upper canopy, or in thick, brushy edges or thickets. Many are brilliantly colored, with yellow predominating. 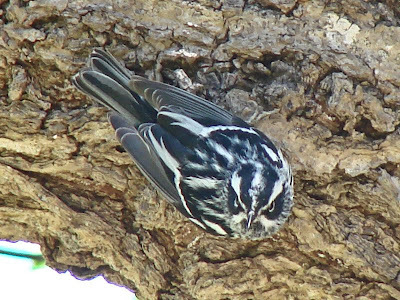 Bold black and white patterns often characterize the wood warblers. 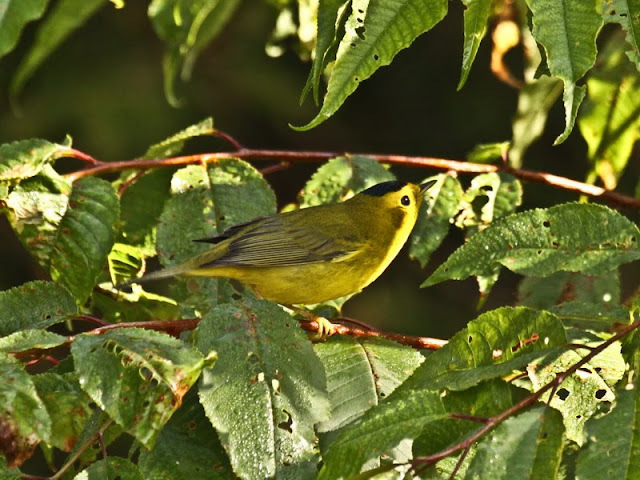 Most wood warblers glean leaves and tree limbs for insects and like manner of protein. In fact it is the abundance of this food source which impels these small birds to travel several thousand miles from their tropical homes to our temperate forests. In their genetic coding, they know that they will find the food resources to quickly raise their young. They are all adapted to exploit these resources, although the adaptations differ according to their favored habitat. 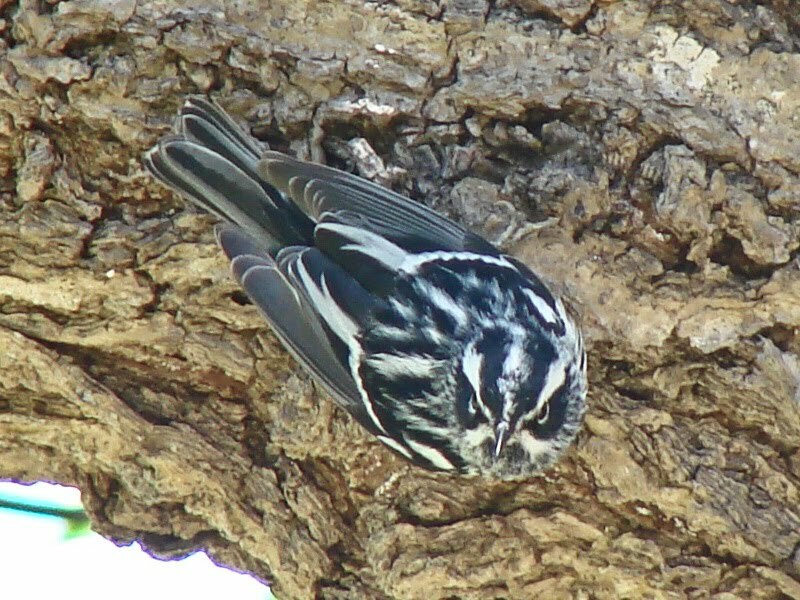 For example, the Black-and-White Warbler forages along tree trunks and branches in a manner very similar to the nuthatches; its shape and behavior is so similar that it can be mistaken for a nuthatch if all one sees is the profile. Two of the most common and accessible wood warblers are the Yellow Warbler and the Chestnut-sided Warbler. Both are also rather accomplished songsters and both are gorgeous. The Yellow Warbler sings at the top of thick bushes, in open woods, orchards, willow thickets, or along streamsides; it is usually not far from water: “Sweet, sweet, sweet, I’m-so-sweet!” He is brilliant yellow, with bright red streaks along his flanks; she is also yellow, but muted and duller. The Yellow Warbler is so common that many birders hardly give it a second look. What a loss! This piece of golden sunshine should be lingered over the way you linger over a fine vintage wine. Perhaps a little more difficult to coax into the open, this warbler is another of those fine vintage wines to savor and enjoy, especially when the males are singing forth on their territory. Enough of the muted grays. The American Wood Warblers are the jewels of North America. My column on Friday in the Brattleboro Reformer focuses on this family, Parulidae. Here are a few photos from my recent trip. More photos will be with the column when posted on Saturday, plus another small gallery following. Please enjoy these birds - best of all, in the field. Note: Schuykill Center is an "island of green - " 500 acres of mixed habitat. Only the planes overhead and the sirens in the distance remind you that you are within the city limits of a big city. On a gray day one week ago, I was at Brigantine (Forsyth NWR). 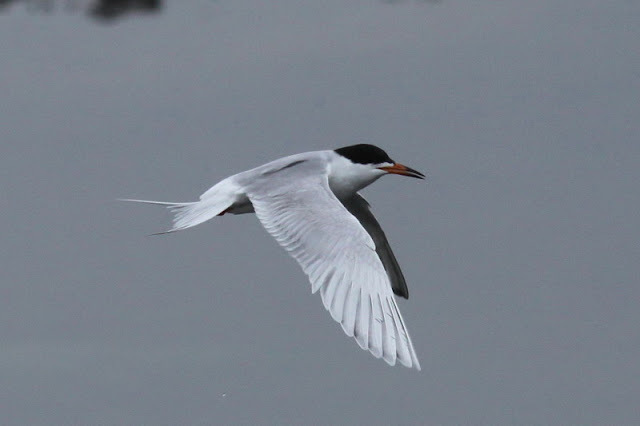 Forster's Terns were common along the loop road and many were in the midst of their courtship with the males demonstrating their prowess by bringing food to the females. I watched several fishing along the canal. We returned home from Philly & southern New Jersey late Friday to be greeted by additional summer residents who arrived while we were away. The House Wren was checking apartments for rent; the Ruby-throated Hummingbird was getting a fast food drink, and the Gray Catbird was singing in the bushes. While away, we also had a visit from a bear who trashed the old sunflower feeder that he trashed last Spring. Fortunately, I had put most feeders out of his reach before leaving. I have to include this photo of the American Robin carrying nesting material. Reminds me of the question I used to ask my kids: Wouldn't it be easier if you made two trips? I had three days in Cape May and southern New Jersey - 1 1/2 days of beautiful, sunny weather, and 1 1/2 days of gray overcast and drizzle. I'll come back to the nice days in future posts after I've had more time to sort the photos. For now, a few samples from a gray day at Brigantine (Forsyth NWR). First an observation. 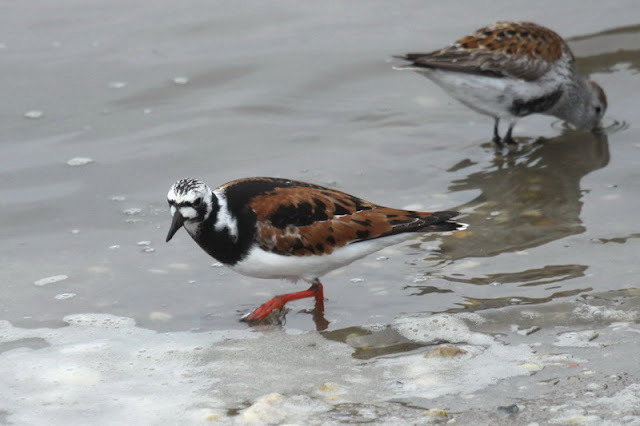 On Monday and Tuesday the number of shorebirds was very small, and at the famous Reeds Beach where so many feed on the horseshoe crabs, there were none - zero - on Monday. Then Wednesday morning I began with a drive across Nummy Island: the shorebirds arrived overnight or early morning. There were thousands feeding in the marshy puddles of the island. The same was true at Brigantine. In spite of the gray day and poor light, the birding was good. 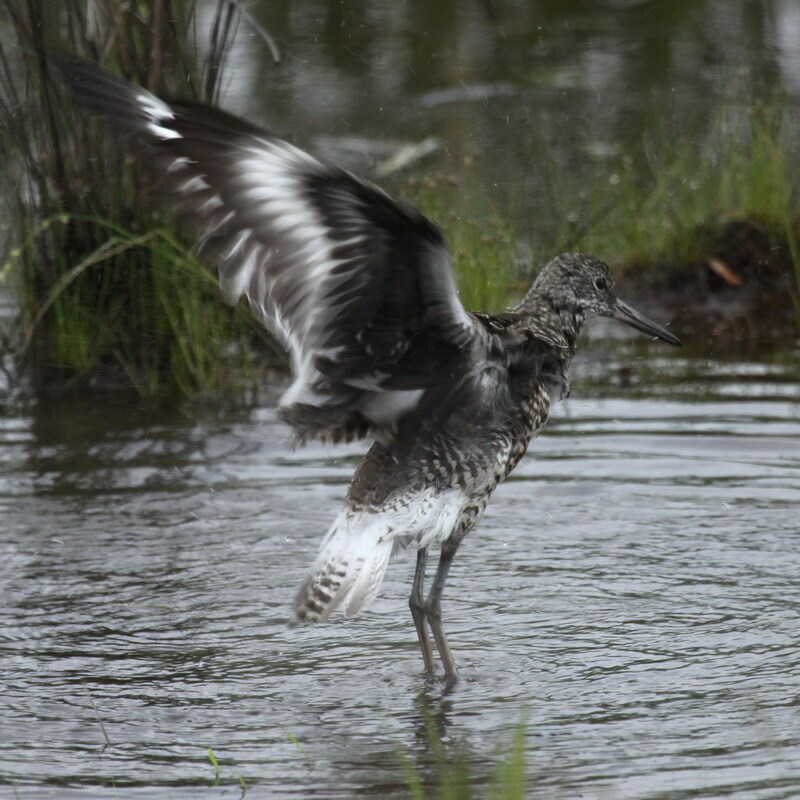 Willets did not just arrive, however. They are well into their courtship and breeding cycle, chasing across the marshes with "pee - will - willet, pee - will - willet." This one was attending to its good grooming - bathing and preening.